John T. Thorngren, author of Salvation on Death Row: The Pamela Perillo Story, has survived three heart attacks and two open-heart surgeries and has a more open, loving heart to show for it. Here’s how those experiences shaped John’s view of life. I must assume that anyone who has had heart problems, especially open-heart surgery, becomes a changed person. Poems, literature, and even our speech reflect that the heart is the center of our being, both literally and figuratively. One does not undergo having his heart chopped on without questioning his mortality and the purpose as to why he is still alive. Oh yes, after any life-threatening surgery, especially open-heart, one notices that the sky is “bluer,” the birds sing louder, flowers are gorgeous—all of the above—and yet depression is often a side effect. Mortality is now a striking reality, and one wonders what to do in what little precious time that might remain. As a survivor of three heart attacks and two open-heart surgeries, I know too well those mixed feelings of gratitude and terror, the sense of wanting to do more with my life but perhaps not being entirely sure where to begin. So like many before and many to come after, I began searching for my Creator and found redemption in Christ. I had my first heart attack—or myocardial infarction (MI)—in 1980 at age thirty-nine and married with two children. Shortly after that, I had a coronary artery bypass graft, a CABG, otherwise referred to as a “cabbage.” In my case, it was a Cabbage X3—three grafts. Within ten years, I suffered two more heart attacks and then a Cabbage X4. A cabbage is a brutal operation. You are cracked open like a crab being prepared for consumption. Veins are removed from your legs and grafted in to replace those pieces clogged with plaque. The life function of your heart and lungs are being performed by a machine. You are officially a dead robot. Has my life changed from those experiences? How could it not? The most notable change is a deep understanding that every life is precious and a special gift from God. I found this in my search for God while spinning the dial on my car radio. 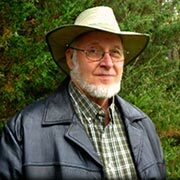 A televangelist, Dr. D. James Kennedy (deceased), was preaching on abortion, a devastation about which I felt indifferent. I listened. The passages he quoted from Jeremiah about knowing him before he was in the womb tweaked my spirit. A turning point. I knew instantly that life from conception is precious. And later by another divine series of events, I found life on Death Row equally as precious. This is the subject of the book, Salvation on Death Row: The Pamela Perillo Story, about Pamela’s redemption, her scheduled execution and her reprieve, and about the three other women with Pamela on Death Row for twenty-plus years, who also found salvation but were put to death by the State of Texas. No entity, no state, no government, no kingdom, no person should ever take the life of a prisoner in revenge. Even after the first homicide recorded in Scripture, the killing of Abel by Cain, God did not inflict the ultimate punishment on Cain. Although Scripture gives the state the right to execute, it does not give us (those whom the state represents) a mandate. How can we call ourselves Christians and have no compassion, no mercy, and no realization for the sanctity of life? Does it take a sickness, a calamity, a fall to the bottom—such as what Pamela and her three fellow Death Row inmates experienced—to realize our purpose on earth, to comprehend the meaning of our life as well as that of others? No. I have seen others come to redemption through a simple curious nature, to find out what will fill that spiritual hole that we all have. Pamela and I hope this book is a lamp to those searching, to those bound in drugs, and to those who are indifferent about the death penalty. John Thorngren, a Texas writer and graduate of the University of Texas, has enjoyed a myriad of life experiences, working everywhere from basements to boardrooms. He is a songwriter published in Southern Gospel and an author of several patents, technical articles, and a nonfiction book on probability and statistics, in addition to Salvation on Death Row. John and his wife of more than five decades live in Shady Shores, Texas, on Lake Lewisville, where their livestock freely roam the grounds. 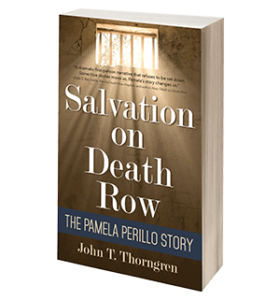 John T. Thorngren, author of Salvation on Death Row: The Pamela Perillo Story, believes firmly that every life is meaningful and worthy, no matter what a person’s background might be. That belief was at the core of his desire to work with Pamela and share the story of her Christian conversion. Here, John writes about what he knows in his heart—and why he knows it. These are five reasons I know God has a purpose for every life. It is a purpose that is not from a deterministic God but one I am convinced occurs from the product of our given free will, one to His glory, that is molded as we move forward from our choices, good or bad. Those listed below are from my observation, but I am certain there are many more. There are many passages in Scripture that detail God’s value for our life such as Matthew 10:29-31, paraphrased: He knows when every sparrow falls to the ground, and are we not worth many sparrows? If He knows when even a little sparrow passes, then how much more must He care for us? If we have no purpose, what could we be worth? Every person’s purpose is to glorify God. Jack Thorngren, my 45-year-old disabled son, who passed away at the first of 2017, is an example. Although heavily dependent on others, a fact he openly detested, he nonetheless displayed courage and mirth and was a blessing to all who knew him. All of us here on earth, whatever our limitations or situations, are here for a purpose. 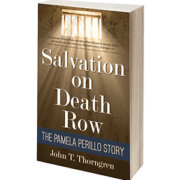 Pamela Perillo, the subject of Salvation on Death Row, is an example. Reprieved two days before her scheduled execution, Pam has been a spiritual help to many inmates. While incarcerated, she has trained over twenty-five service dogs for Patriot PAWS, which provides the animals without cost to disabled American veterans and others with mobile disabilities and PTSD symptoms. Pam plans to continue this vocation when finally paroled as a way of giving back to the world that which she has taken. From an historical perspective, look at those who have been our inspirations, people such as Paul of the New Testament, Helen Keller, Joni Eareckson Tada, etc.—an innumerable list through time of those with afflictions who encouraged others through their sufferings. But the greatest example of purpose, of course, came in the presence of our Savior, Jesus Christ. John T. Thorngren, a Texas writer and graduate of the University of Texas, has enjoyed a myriad of life experiences, working everywhere from basements to boardrooms. He is a songwriter published in Southern Gospel and an author of several patents, technical articles, and a nonfiction book on probability and statistics, in addition to Salvation on Death Row. John and his wife of more than five decades live in Shady Shores, Texas, on Lake Lewisville, where their livestock freely roam the grounds. 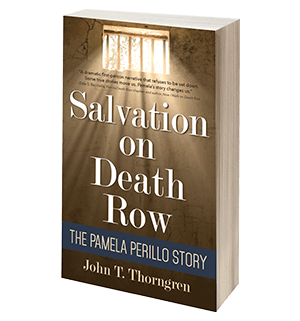 John T. Thorngren, author of Salvation on Death Row: The Pamela Perillo Story, writes about the experiences that caused him to change his thinking about capital punishment and undertake the process of telling the true story of life on Death Row in Texas. Although we may be merciful and compassionate in our hearts, there are instances to which we are ignorant—and therefore merciless by omission. As an example, consider the sufferings of the inhabitants in Country X, of which we have no knowledge. We might have an inkling of their existence but no details on their plight nor means to help them. But closer to home, there are instances to which we are merciless by indifference, such as abortion or the death penalty. Indifference, in these cases, refers to those who have little or no concern about taking another’s life under special circumstances. Such special circumstances are ordained by the state and therefore not in their realm of interests. Is omission worse than indifference? Is abortion worse than the death penalty? These are personal questions best answered by one’s direct experience. My indifference to the death penalty changed in a remarkable incident. When we moved to Shady Shores, Texas, I met a young man headed into the woods behind our house. I commented on his cap that had a cross on it and learned he volunteered to help the homeless in Denton, seven miles from us. He and his wife were renting a small mobile home nearby. Some years later they moved, and we kept up through Christmas cards and e-mail. One day I received an e-mail from his then-ex-wife that “Jerry” was due for execution in another state for multiple homicides. How could this be? How could a professed Christian commit murder? I later learned that it was not Jerry, per se, but Jerry in an altered state under the influence of drugs. Jerry received a stay of execution while his appeals ground through the slow legal process, the limbo between life and death. They are ongoing. Jerry and I agreed to write his painful story in hopes that it might help others, but shortly into this effort, he realized that such information might endanger his appeals, so we placed the project on hold. Still, I felt I needed to do something on behalf of all of those on Death Row, for we all have a purpose for our lives and the state should not take a life in revenge. Starting with a fictional heroine, condemned to lethal injection, I would create the great American novel about the injustice of the death penalty. But I needed some authentic background on the actual process. By divine chance, I found an old pen-pal request from Pamela Perillo, who had been on Texas Death Row and was still incarcerated at the Lane Murray Unit in Gatesville, Texas. To that point, Pam had refused authors wanting to write her biography because they seemed transfixed on the sensational aspects of her life. But she and I discovered that we had a Christian match and a mutual purpose for sharing her story: to release but one person from the chains of drug addiction and subsequent imprisonment. Thus began our seven-year effort to create Salvation on Death Row: The Pamela Perillo Story. And thus began my walk as a Christian—as a human—no longer mercilessly indifferent to the wrongs of the death penalty. John T. Thorngren’s life has been one of varied experiences that have taken him from Paris, France, to the oil fields of Texas. He’s manufactured car-wash soap, owned a retail store, operated a chemical plant, and programmed computers. He’s the author of a book about probability and statistics and a songwriter of Southern Gospel. So maybe it’s only fitting that an unexpected path led him to tell the story of a woman condemned to die on Texas’s Death Row, now hoping for parole in 2019. The twists and turns of his life have led Thorngren to find the value in every human soul, regardless of the journey that soul has taken. This is the background behind Salvation on Death Row: The Pamela Perillo Story. How did you come to know Pamela Perillo’s story, and what made you decide hers was a story you wanted to write? I discovered an old friend was on Death Row in another state. Drugs were the root cause. As an effort to bring attention to his case, I decided to write a fiction novel about a woman falsely accused and condemned in Texas. Needing realism, by chance, I contacted Pamela Perillo, currently incarcerated in Gainesville. Pamela is a private person and had never allowed anyone to tell her story. We found we had a spiritual match and so began this effort. Tell us about the process. How long did it take you to research the many documents and legal proceedings you cite, and how did you work with Pamela to bring her voice to the project? Pamela and I worked on this project from 2010 through 2017. This involved over fifty telephone conversations, 150 letters, and countless hours of research. Did you ever find yourself surprised or challenged by what you learned as you wrote the book? Yes, very much surprised. I was surprised about how political the causes for and against the death penalty have become. I was extremely surprised about the Frances Newman case. She personified the worst fear of those against the death penalty—the execution of the innocent. I and many others believe she was unjustly convicted and condemned. How did this project change or affect your beliefs about the criminal justice system and, specifically, capital punishment? I once believed that the criminal justice system and capital punishment were fair and equitable—a sort of Pollyanna viewpoint. Now, I believe that there are dark undercurrents to the contrary, and that once you are convicted and condemned, the justice system behaves like the proverbial snapping turtle that will not let loose till it thunders, regardless of evidence to the contrary. Slowly, I see our country becoming more compassionate regarding the death penalty, and I am encouraged. Can you tell us about Patriot PAWS and why you chose that organization to benefit from the proceeds of Salvation on Death Row? Patriot Paws was chosen on behalf of Pamela’s efforts to train service dogs. As noted in the book, Pamela’s encounters with animals throughout a difficult childhood shaped her talent in what she is doing now. She and her fellow trainers have made many service dogs available without cost to disabled American veterans and others with mobile disabilities and post-traumatic stress symptoms. Pamela plans to continue this effort after she is released. Certainly, any monies from my involvement should go to Patriot Paws, as neither Pamela nor I began this effort for profit. There’s a beautiful video describing Patriot Paws through the eyes of Texas Country Reporter; Pamela is in several scenes. How does your own experience, as the survivor of three heart attacks and two heart surgeries, influence your thinking about the value of all people’s lives? I am sure everyone who has had their chest cracked open like a crab will tell you how much bluer the sky looks. But I believe everyone, if they look back on their life with discerning eyes, regardless of their health, prosperity, or misery, must conclude that they were put here for a purpose, that every life is precious and none worth taking. What do you hope readers take away from learning Pamela’s story? I would answer this with a short story from a personal experience. Years past, I used to write my own Christmas cards, a poem or a two-paragraph vignette. These went out not only to family and friends but to business contacts, many of whom I had never met. For several years there were no comments—good or bad. One afternoon, one of these business contacts, whom I did not know, telephoned and said the card had made his Christmas. One rarely knows what we do that benefits others, but when we do—even for just one—we leap with joy. So if the story of Pamela’s life helps but one soul, then our effort was well worth the undertaking. KiCam Projects is delighted to welcome our newest author, John Thorngren, whose book will release in January 2018. John, of Lake Dallas, Texas, is telling the story of Pamela Perillo, who has been imprisoned in Texas since 1980. Convicted of capital murder, Pamela initially was sentenced to death before she was resentenced to life in prison, plus thirty years, in 2000. Pamela’s story is one of healing and conversion. Addicted to drugs from a young age, Pamela got clean and sober in prison and developed a true Christian faith. Her spiritual salvation has been the focus of her life behind bars, where she has shared her faith with her fellow inmates and has found meaning in training dogs for the disabled. John’s book bears witness to the tragedies of abuse and addiction, the horrors of Death Row, and the potential for change within each person. Proceeds from the book will benefit Patriot PAWS service dogs—a testament to the fact that each person’s life, each person’s story, can make a powerful, positive impact on the world. Welcome to the KiCam family, John!